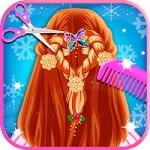 Look after your hair and make a new variety of hairstyles. Everything is done in stages, so after passing this game you can learn a lot. Girls like to change the style of their hair every day.